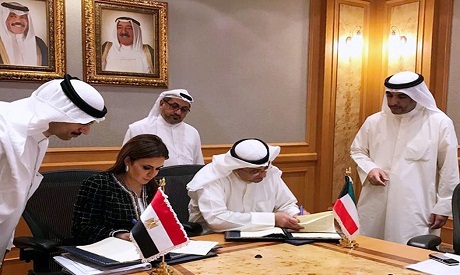 Egypt's Investment and International Cooperation Minister Sahar Nasr signed two agreements worth 17.5 million Kuwaiti Dinars ($57 million) in Kuwait on Sunday with the Kuwait Fund for Arab Economic Development (KFAED) for development projects in North Sinai, according to a statement issued by the ministry on Monday. The first agreement, worth 12.5 million Kuwaiti Dinars ($41 million), will fund sustainable water infrastructure projects in Al-Arish city. The fund will help finance the government’s $900 million three-year financing planned projects for the Sinai Development Programme, Nasr said. The government has been financing the Sinai Development Programme through various funding agreements with the Saudi Fund for Development and other funds to establish water desalination plants and electricity projects, build schools and health units, and develop agricultural lands. The second agreement signed on Sunday with the KFAED, worth 5 millionn Kuwaiti Dinars ($16.5 million), will finance a 400 thousand-feddan reclamation project in North Sinai. This fund would increase the area of cultivated land in North Sinai in order to offer job opportunities and establish a residential community as a way to achieve sustainable development. “This is in addition to helping farmers by facilitating the movement of their crops to markets, facilitating access of fertilizers and pesticides and increasing livestock, besides providing more than 5000 individuals with job opportunities and encouraging investments in the area,” the statement read. KFAED has so far provided $2.763 billion in financing to 44 projects in Egypt, in addition to $52 million in the form of 15 technical grants, according to Abdul-Wahab Al-Badr, director general of the KFAED. On Monday, Nasr met with the Egyptian-Kuwaiti economic cooperation council to discuss the incentives offered to investors by the new investment law, including tax breaks of 50% on investments costs for projects in underdeveloped areas such as Upper Egypt and Sinai, according to another statement from the ministry. The minister also presented to the council investment opportunities in the new administrative capital, the Suez Canal Economic Zone, and New El-Alamein City. President Abdel-Fattah El-Sisi ratified the country's new investment law in June and its executive regulations were approved by the Cabinet last month. The Egyptian-Kuwaiti economic cooperation council was established in November 2015 to boost economic ties between Egypt and Kuwait.